ZSW Series Vibrating Feeder is mainly used to feed material into primary crusher evenly and continuously. 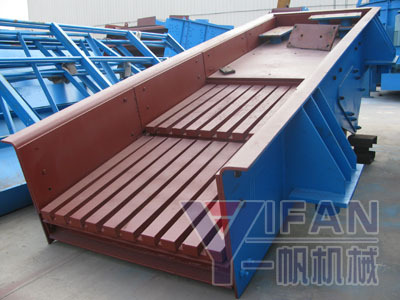 Meanwhile, it can screen material and strengthen the capacity of the crusher. It adopts double eccentric shaft vibrating characteristic, so ensure it can bear the impact of large material and enhance feed capacity. It puts massive, granular material continuously, timely, evenly into feed devices from storage silo. This prevents feed devices happen system halting phenomenon due to uneven feed, so it extends the equipment life. Feeder can be divided into steel structure and the comb structure, steel structure is mainly used for feeder aggregate production lines,and put materials into the crushing equipment. Comb structure feeder can make a rough screen to the material, make the system in preparation more economic.It becomes a necessary equipment in crushing and screening field. The vibrating feeder is widely used to match the crushing and sieving equipments in many industries including metallurgy, coal mine, mineral dressing, building material, chemical, grinding, etc. ZSW Series Vibrating Feeder is composed of feeding channel, exciter, spring support, and gear. vibration exciter is the source of the feeder. Vibrating exciter is composed of two sets of eccentric (drive shaft and driven shaft)and gear wheel. Drive shaft with motor though V-belt, then the upper gear on drive shaft running with driven shaft, drive and driven shaft reverse rotation at the same time, channel vibrating, so material flow contiously and get the purpose of conveying materials. This series vibrating feeder is reliable operation，low noise，low power consumption, long service life, simple maintenance，light weight, small volume, easy installation, good performance. When adopt closed structure frame, feeder can prevent dust pollution. Note:Capacities are relative to physical character and type of feeding,feeding size and composition and so on.